The management of Fringe Benefits Tax (FBT) obligations is often seen as an additional compliance task, not as important as other compliance obligations such as income tax, GST and PAYG withholding tax. However, FBT obligations that are not appropriately managed or accounted for can impose significant on-costs for businesses. However, these ancillary costs may, in certain circumstances be excluded from the value of entertainment benefits provided to employees. Therefore, to properly manage the FBT obligations of your business, we recommend careful analysis of all of the components of entertainment costs to ensure that they are treated appropriately for FBT purposes. 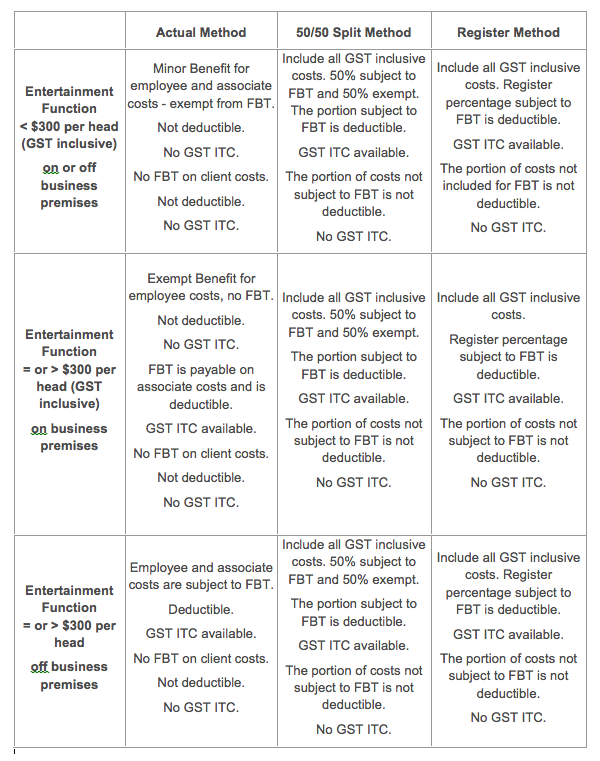 To assist you with your analysis of entertainment expenditure, attached is table with basic notes in respect of the FBT, GST Input Tax Credits (GST ITC) and income tax deductibility of some of the common items of entertainment expenditure that businesses incur around Christmas time. * This assumes the entertainment is not meal entertainment or if it is meal entertainment, that the actual method is used. If the entertainment constitutes meal entertainment and the 50/50 split method or register method are used, the costs must be included as per the method requirements. Please note that the application of the minor benefits rule is limited for income tax exempt businesses in relation entertainment benefits. 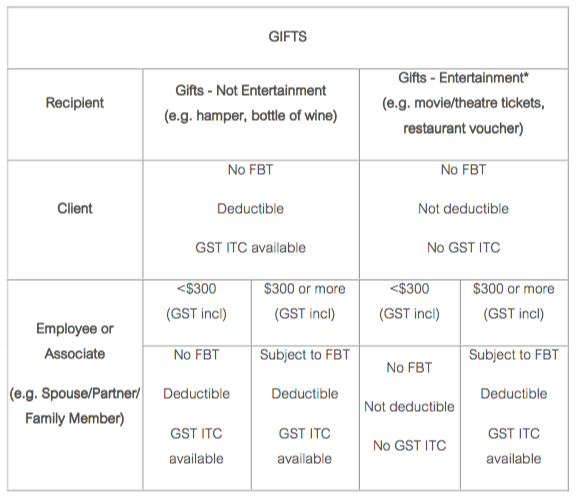 The correct tax treatment of costs associated with Christmas functions can be confusing as it depends on whether the employer is concessionally taxed for FBT and income tax purposes, and the method chosen by the employer to value meal entertainment for FBT purposes (there are three methods: 50/50 Split, Actual or Register). The table below summarises the treatment for an ordinary business taxpayer (i.e. it does not apply to income tax exempt businesses). Please remember to keep necessary documentation on file such as attendance lists to allow the calculation to be made correctly, accurately and be substantiated in the event of a tax office audit. Entertainment costs (e.g. Christmas party costs) are only tax deductible, and GST ITC is only available to the extent that the costs are subject to FBT. Where event costs are exempt from FBT, there should be no income tax deduction nor any GST ITC entitlement. Note: The table is designed to apply to most common circumstances and is only meant to provide an indication of the likely FBT treatment. Employers should seek independent tax advice on their specific circumstances before entering into any arrangement or transaction. The FBT treatment of festive season entertainment costs for income tax-exempt employers (who are taxable for FBT purposes) is substantially similar to that of an income tax paying employer where the 50/50 Split or Register Methods are chosen. However, where the Actual Method is used, FBT is generally payable on costs relating to the employee and any associate(s) regardless of the cost or location of the function (i.e. the minor benefit and food and drink consumed on premises exemption are not available to income tax-exempt employers). Under this method, the costs relating to the entertainment of clients should remain not subject to FBT. The FBT rate decreased from 49% to 47% effective 1 April 2017, as a result of removal of the 2% Budget Repair Levy. The FBT gross up rates subsequently decreased to 2.0802 for Type 1 and 1.8868 for Type 2 benefits. Employer systems and processes should be modified to reflect this change, particularly in respect of pay-related software applications. Similarly, from 1 April 2017, the current cap per employee of $17,667 and $31,177 decreased to $17,000 and $30,000 for certain non-profit employers.